Seeds may be classified as orthodox or recalcitrant. These terms refer to their moisture content and whether or not they can enter into a state of (prolonged) dormancy. The seeds of most plants growing in a temperate climate (such as that found in the UK and western Europe) gradually dry as they mature and many enter a state of dormancy. Seeds that are tolerant to this drying process and which can be stored for a long time are said to be ‘orthodox’. In this dry state, all the chemical reactions taking place within the seed occur at a very slow rate. The seeds of tropical plants, by comparison, often have a high water content even when mature. They are less tolerant of drying and also are less likely to become dormant; they are said to be recalcitrant. Such seeds usually find themselves in conditions where the basic requirements for germination namely water, warmth and oxygen, are nearly always fulfilled. They often germinate soon after dispersal. Though recalcitrance is a feature of many tropical species, there are some English species which show such behaviour, such as the Oak, Sycamore and Horse Chestnut. 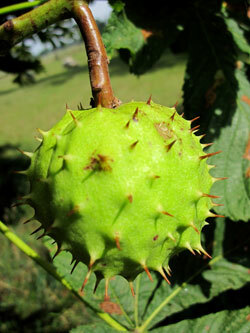 The seed of the Horse Chestnut is large (weighing about 5g); and unlike most recalcitrant seeds, which are non-dormant and germinate soon after dispersal, conkers are dormant. However, the germination of conkers can be improved by a period of low temperature. 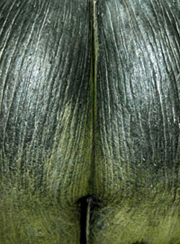 The largest known seeds are those of the palm “Coco de mer”, Lodoicea maldivica (see photo). The fruit may weigh between 15 to 30 kg (though the heaviest recorded was about 42 kg) and its seed may weigh up to 17 kg. 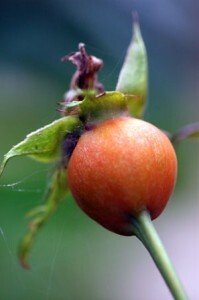 The fruit and seed may take some 6 to 7 years to mature, and the seed may take two years to germinate - when dispersed. The palm is now endemic to two islands of the Seychelles – Praslin and Curieuse. The dormancy seen in orthodox seeds is a means to promote the dispersal of the seeds in both time and space. Because such seeds are usually dispersed from the parent plant at the end of the growing season, they will then face a period when the conditions for growth are less than ideal (short days, low light intensity, low temperature etc). Dormancy can ensure that the seeds do not begin to grow at the end of the summer only to meet with the cold and high winds of autumn and winter while they are young and tender. Whilst the seed lies dormant there is a chance that it will be dispersed – well away from the parent plant, so that it will not be in competition with the parent or other seeds dispersed at the same time. The mechanism of dormancy varies from species to species. Some seeds are dormant because their seed coat or testa is hard and impermeable, restricting the entry of water and gases. Some tropical and sub-tropical legume tree species have seeds with hard, impermeable coats (Acacia, Robinia, Laburnum, Leucaena species) perhaps to protect the seeds from insect attack. In nature, this hard coat will be gradually degraded by the activity of soil microbes (bacteria and fungi) so that water and oxygen can enter. The water hydrates the cells and enzymes, and the oxygen allows the seeds to become active, so releasing energy from food stores for growth. 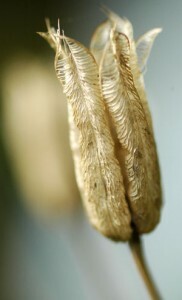 Alternatively, the seed may be exposed to alternate drying and wetting; this gradually weakens the testa – the seeds of Teak (Tectona grandis) may fall into this category. Sometimes, the seed coats are broken down by their passage through the gut of birds or mammals. 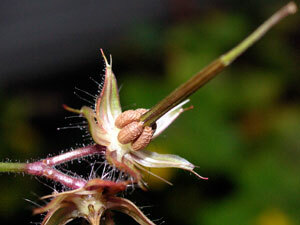 The physical breakdown of the seed coat is sometimes known as scarification. Experienced gardeners sometimes scratch or cut seeds with thick, hard coats to help germination. Hard seeded pines are sometimes clipped for this reason. In some ecosystems, occasional fires achieve scarification of the seed. Fire, and the smoke associated with it, are important in the germination of various Australian and South African species. Fire may also help with the release of seeds (from cones etc) from the parent plant; it may also help create open areas (and thus high levels of light) which some species need for germination and / or early growth. Thus, Scots Pine (a shade intolerant species) will not regenerate under its own dense canopy. In the past, it is thought that forest fires and the behaviour of wild boar played a part in generating the exposed mineral rich soil in which pine seedlings could flourish. Sometimes, dormancy is due to a soluble inhibitor of germination being present in the seed coat and tissues surrounding the embryo. Such inhibitors can be slowly washed (leached) out of the seed by rain and water permeating through the soil. Desert species may use this mechanism so that their germination coincides with a time when there is sufficient water in the soil / environment to ensure germination and subsequent growth. The seeds of many temperate species, including deciduous and coniferous trees often need to be exposed to a period of low temperature. This low temperature requirement may be a matter of days or even weeks. It has been suggested that one of the effects of global warming would be to ‘deprive’ the seeds of many temperate species of their ‘cold period’, which would lead to a gradual change in the species composition of our woodlands. This cold requirement may be simulated artificially and is known as stratification. The cold period may have its effect by causing the level of a germination inhibitor - abscisic acid to fall in the tissues surrounding the embryo. Indeed, abscisic acid can be used in induce dormancy in non-dormant seeds, for example in non-dormant seed of some Ash species. If a seed is buried deep in the soil, it may not have the reserves to reach the surface. It is better that it remains dormant until such a time that it is nearer to the surface, perhaps through the activities of an animal digging - worm casts etc. To this end, some seeds have a light requirement that breaks dormancy and allows germination when the seed reaches the surface or is near to it. The intensity of light required is low (roughly equivalent to moon light) but the wavelength is critical. The important wavelengths are red (680nm) and far red (730nm) light. Red and far red light act on a pigment, known as phytochrome. When the phytochrome in the seed is exposed to red light, it triggers the processes that lead to germination. Exposure to far red light or a lack of light inhibits germination. Seeds that are buried are unlikely to receive the red light needed for germination, and similarly those that find themselves under a dense canopy of leaves are not likely to receive enough red light to stimulate germination. The leaves of the canopy will remove most of the red light for use in photosynthesis. Once the signals for germination have been received (light, chilling, leaching etc), the seed returns to an active phase of metabolism. Water is taken up (imbibition), enzymes (catalysts) are hydrated, the rate of respiration increases and energy is released. New cells are formed in the meristems and growth begins – usually with the emergence of the young root or radicle. It is then that the ‘struggle for existence’ really begins.